The second leg of my rescheduling should see me do 50+ miles today again. It is a beautiful morning with little or no breeze to speak of and I roll through fields and fields of farmland. Today’s route will be a deviation from the N roads which shadow the main motorways and it is some relief from the drone that has accompanied some stretches during the last few days. I plan to get to Valladolid before lunchtime and then navigate my way to the start of my preplanned Val to Palencia ride. That should leave me with about 35 miles to do after noon. I always spend half an hour each evening just getting the following day’s ride in my head. I knew that I shouldn’t go near Valladolid centre and that I could scoot around, approaching from the west, to pick up my route North if I just kept my instincts about me. Sure enough, chuffed as I was, I did the scooting, and was heading north out of Val by 11.45 am. Result ! The villages came quickly and it was a real motivator to knock them off one by one. I had energy in the bank and so I made a deal with myself. The first town to be able to sell me a Coke without me deviating from my route becomes my lunch stop. Cor, did they let me down ?! Eventually hunger won and I sauntered into Cigales looking forward to parking my rear and enjoying empanada Part Dos. I was impressed by Cigales as I rode in. It seemed to be spotless, with modern housing, cheek by jowel with more traditional elements, in streets that cast a certain charm. I found myself a Coke and pastry at a corner shop and rested in the shade in the market square to enjoy my lunch. …..and this view on my left. 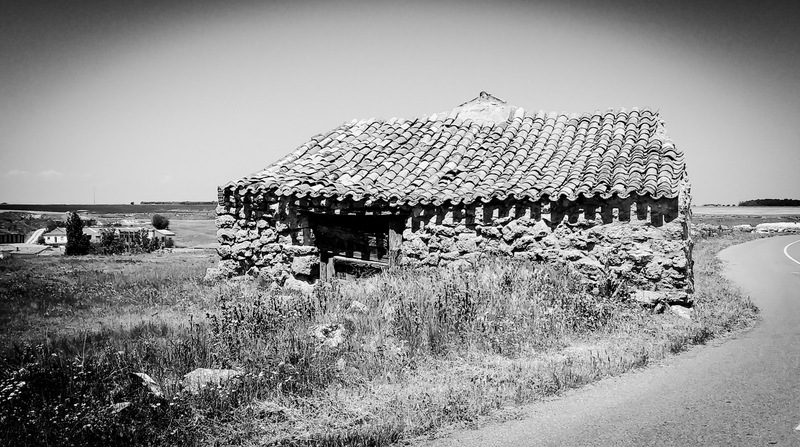 I sat happy and contented with the morning’s work, my spirits only dampening a little as I watched the once lifeless Spanish flag flutter and waft in what I knew was a lifting breeze. You will have noted my comments so far about the headwind here. The impact is intensified by that fact that there really is nowhere to hide. Many roads are dead straight for very long stretches so shelter, even briefly, is a rare thing indeed. This area is known as the Tierra de Campos, a wide vast agricultural plain, with dry, fertile clay soil and adapted farming methods which give the landscape a patchwork quilt appearance. And lo, the wind blew gusterly blusterly. I pulled out in front of a tractor pulling a loaded haycart. He was about 100 yards behind and we both seemed to be doing the same speed. Aha, I thought. My peloton. I stopped to let him overtake me so that I could ride right behind him, hidden from the wind and hidden from view with the smell of fresh cut hay drifting over me. 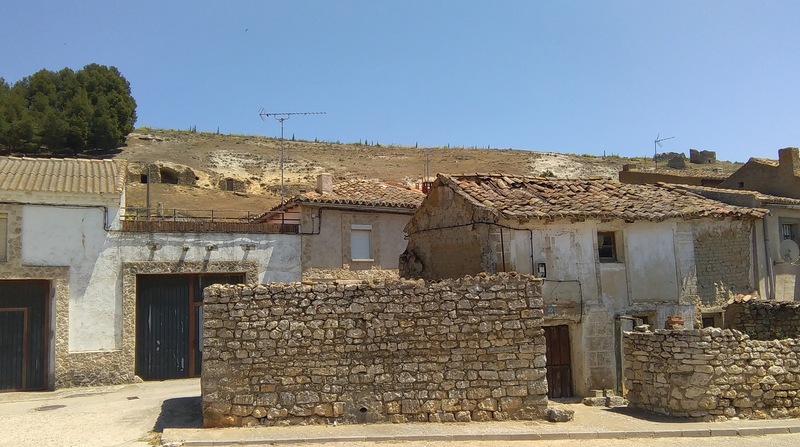 Trigueros del Valle….notice the grain/food stores cut into the hillside. 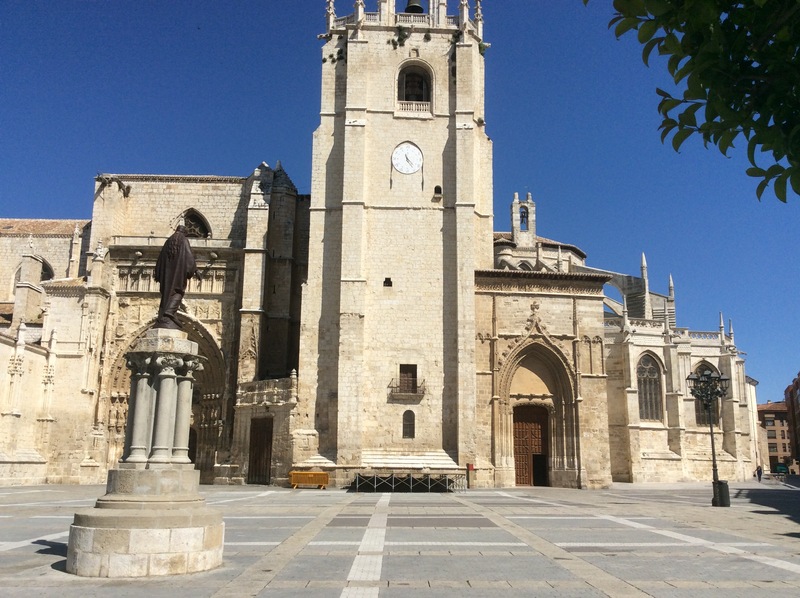 Palencia was quiet and hot when I arrived. It seemed to offer little by way of charm as your gently perspiring yet wind chilled blogger pushed his heavy load through the tightly woven streets to his resting place. All I could see were closed shops, streets and streets of them. I imagined what Cheltenham would look like without the regency. The ferry back to the UK sails twice a week. 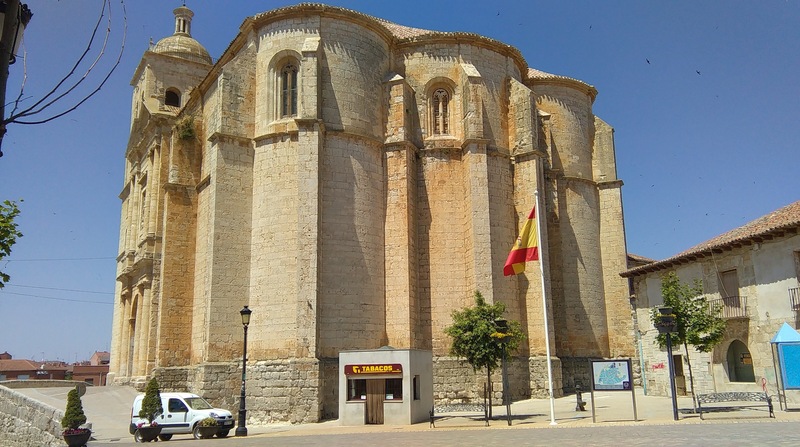 I knew I wouldn’t make the Sunday sail so Wednesday it is, and Palencia was to be another rest over town. 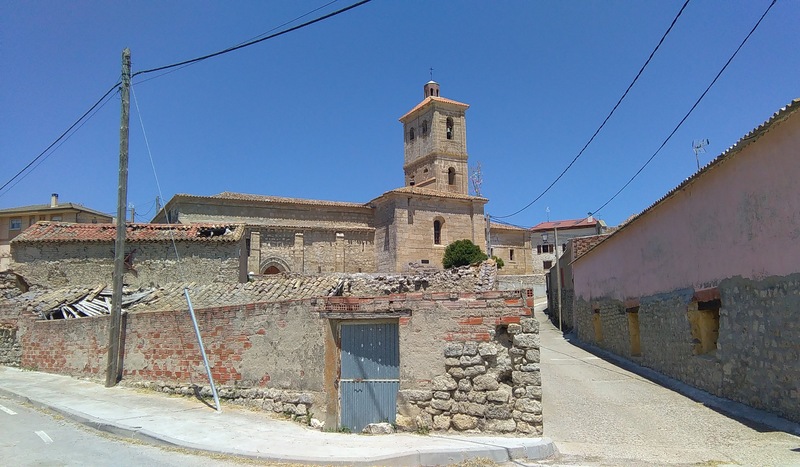 Like many Spanish towns on this trip, medieval churches stand as stubborn reminders of a glorious past as modernity, with its mercurial spread, shuns its foundations and moves on around them. Saturday morning I find the cathedral, and, failing to spot the sign that said the entrance was for worshippers only, I find myself in a secluded corner of the vast building listening to some lovely Latin anthem. There was a service in full flow. Realising my error I crept out, found the tourists entrance, and paid the cathedral the respect it deserved. 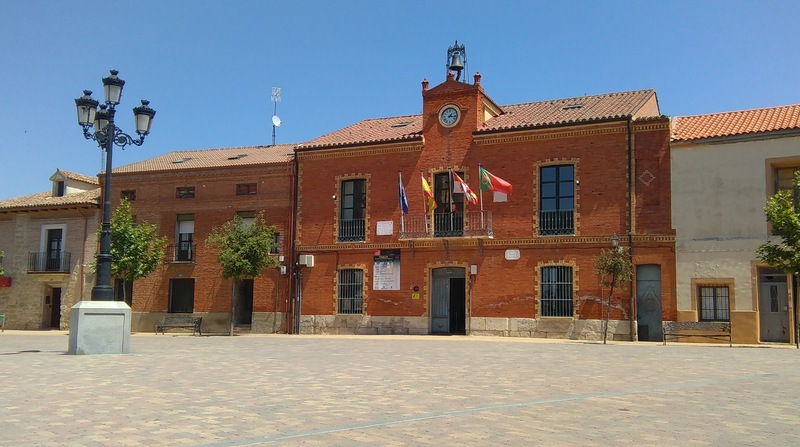 The Church might think it rules the roost but its the Plaza Mayor where the action happens. 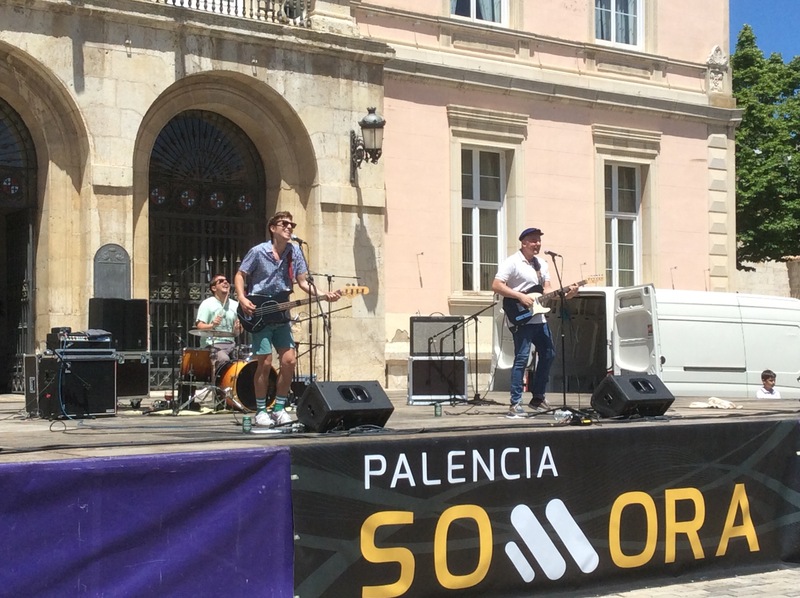 Having not had the opportunity to make this a musical experience it is ironic then that Palencia comes up with the goods. With a beer in hand I pondered the stage in front of the Town Hall, amused by the antics of soundmen and roadies (don’t they always look serious and self-important ? – rock n roll is meant to be fun). The stage is set for a trio. The soundcheck sounds interesting so I resolve to stick around. When they eventually appear at about 2.00pm the sun and the beer is beginning to kick in and the crowd are ready. And they were great. It was like listening to the Spanish Buzzcocks. The band is called Novedades Carminha and I thoroughly enjoyed a lively and energetic set. Excellent stuff. But now it is siesta time. I shall visit the Square again this evening after I have had a lie down.